when he attempts to pronounce any word, he protrudes his tongue, for the distance of at least an inch, between his teeth and lips, withdrawing it again; and these movements he is compelled to perform several times, before he can express the word he desires. and placing my little finger in the wound beneath the tongue, I felt for any structures that became tense when the tip of the tongue was elevated, and divided these also, having first passed a curved director beneath them. This is all without anaesthetic, by the way. and the patient did not experience the slightest benefit from this operation. It being urged upon me by one or two professional friends who saw the patient some time after the operation of dividing the frenum linguae and the genio-hyo-glossi muscles, that the uvula might be more or less engaged, I snipped it off at its base. This proceeding was not followed either directly or remotely by any change in his pronunciation. At this point Dr Bennet Lucas decided to try a radical approach, a new operation invented by Professor Dieffenbach of Berlin. 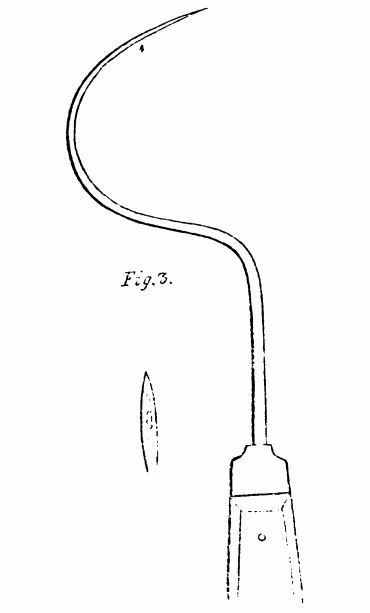 It involved the use of three specially manufactured – and fearsome-looking – needles. Three of these. Without anaesthetic. The patient was seated in the manner best calculated to allow the light to enter his mouth, and his head was supported by an assistant. I seized the apex of the tongue with the thumb and fore-finger of my left hand, a napkin intervening, and drew it to the fullest extent out of the mouth, but without giving any great degree of uneasiness to the patient. 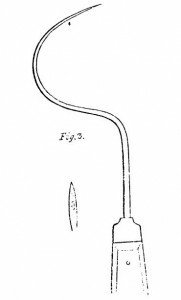 I next introduced one of the needles, entering its point a little behind the anterior half of the tongue, and exactly in the mesial line of the organ, and continued to direct it as much as possible downwards, until the little resistance offered by the less compact structures beneath the true substance of the tongue, and the length of the portion of the needle introduced, showed me that I had completely penetrated it. 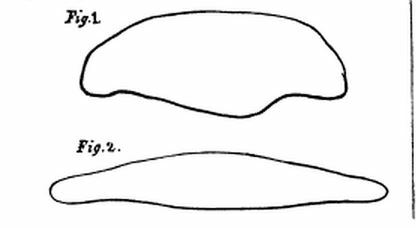 I next depressed the handle of the needle, and at the same time urged the instrument towards the base of the tongue, until its point appeared more than an inch behind the orifice of entrance. That’s just the beginning: he then inserted the other two needles, armed with ligatures ready to stem the bleeding. Having completely penetrated the true substance of the tongue, and also part of the less dense tissues beneath it, I removed by two incisions a wedge-shaped portion of the organ… My colleague, Mr. 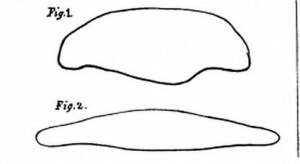 Chance, made an etching of the portion of the tongue immediately after its removal, and has furnished me with the accompanying outline of its dimensions. The patient bled heavily – as you’d imagine – but Dr Bennet Lucas was able to stem the flow by pulling on the ligatures. Before the operation, the patient had his bowels freely moved by aperient medicine; when it was complete he was removed to bed, enjoined to observe perfect silence and rest, and was furnished with warm lemonade to moisten his mouth as often as he desired. The patient possessed great fortitude, and all through the steps of the operation evinced the utmost nerve and steadiness. “Thomas Young” one and a half seconds. “Number 18, Hull’s Place, John’s Row, St. Luke’s” seven seconds and five seconds. He is greatly benefited by the operation, but not cured. He can make himself readily understood at all times, but his hesitation is at one time worse than at another. He said that yesterday evening he found great difficulty in saying “ten shillings”; to-day he says it readily. He evinces no appearances of spasm of the lips or nares, and says that he has had none since the operation.